Wow. We did it! Not only did we hit 200 episodes, but we did it 200 weeks in a row. A special thanks to our community whom I give all the credit to for allowing this feat to be accomplished. Without you and your willingness to share your experiences, there is no way we could have done 200 weeks in a row with uninterrupted content. For this episode, we are bring back two members who were part of our first 10 episodes and we’re all “talking mistakes”. Given the idea of the show is to show the “realistic” side of trading, I figured what better way to celebrate 200 episodes than all sharing some of our biggest screw-ups, no matter how embarrassing they may be. Let’s go! Today we celebrate making it to 200 episodes with Nate, Hooch, Clay and Chezz. 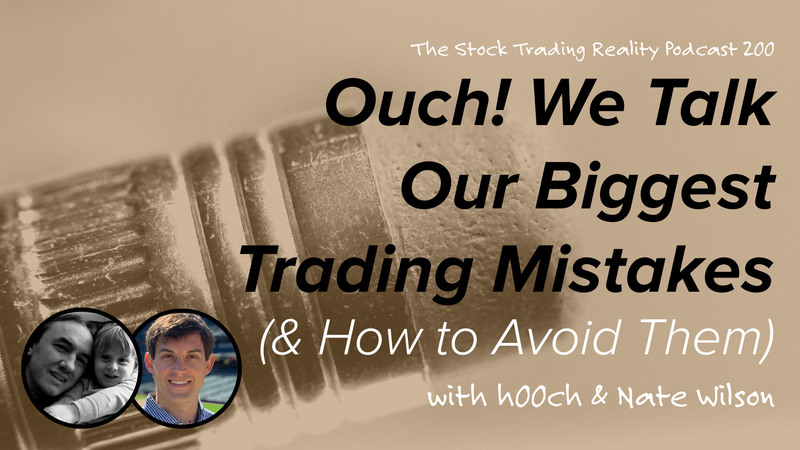 We spend the episode talking about the three biggest mistakes they’ve made since they started trading. The first eye opening mistake most of us made was not being completely aware of the commission structures and how they vary across multiple brokers. One of Nate’s biggest mistakes was thinking that a bad trade he was in could not get any worse… when in reality it can always get worse. Trade what you see, not what you think. Hooch talks about the importance of multiple sources of income. He clarifies that you do not need to start the next Fortune 500 company to earn some extra income. Multiple sources of income provide you mental comfort if your trading wasn’t as stellar as you had expected. Chezz talks about putting a set time frame for when you should start to be ‘good’ at trading. In reality, everyone takes a different amount of time to hone their craft. When talking about trading mistakes specifically, greed is one that spans across the board. Everyone has to learn how to wrangle this emotion if they ever want to have lasting success. An important criteria for trading always involves liquidity. Regardless of your ability to buy, if you’re unable to sell then you’re opening yourself up to the possibility for a big loss. Hooch’s final thought is to remember there are times when you probably shouldn’t trade. This relates to major life changes such as marriage, more children on the way, buying a new house, etc. Anything that is a large event in your life can impact your mentality which will come out in your trading. You don’t have to start up a new Amazon… even if I make an extra 40-50 bucks in the afternoon I find that really helps me mentally. Overconfidence or thinking you can put a set time frame on when you think you will be good at trading is my biggest mistake. Greed is one of the worst things to deal with emotionally when trading. Doesn’t matter how good or bad your day is going. You always think you can squeeze out a little bit more. Another big mistake is knowing when not to trade. Such as getting married or moving or something major on your mind. Trading is such a mind game.